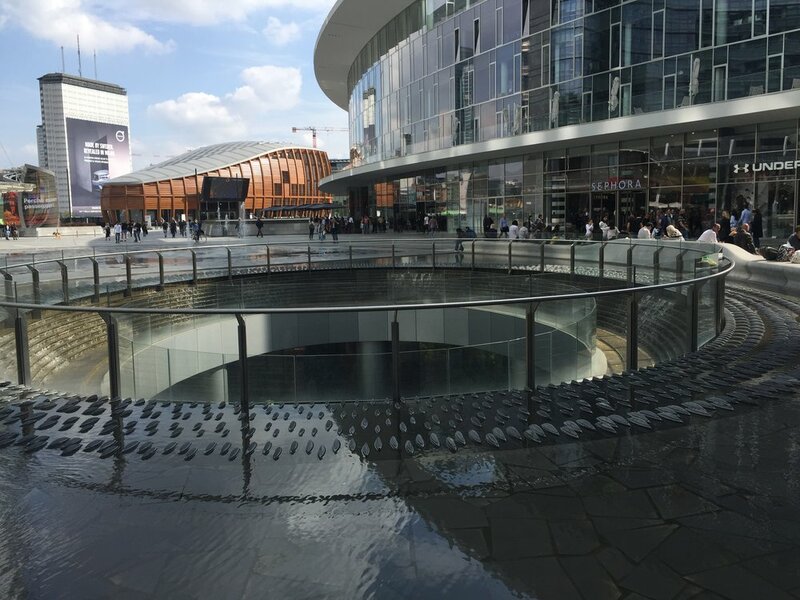 Judith and I went sightseeing to 10 Corso Como: a sort of hipster complex of fashion store, bookshop, gallery, cafe and bar. The last time I felt so unworthy in fashionista terms was in Williamsburg in New York! 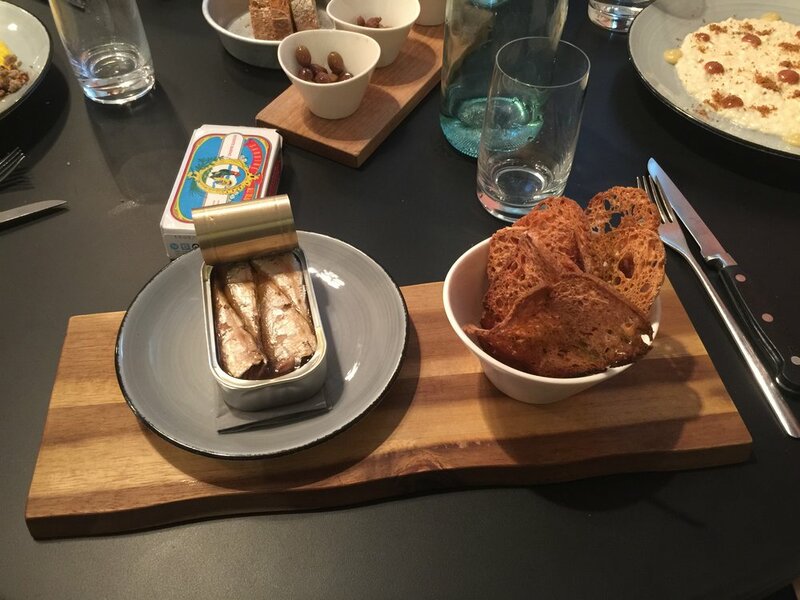 We had lunch nearby in a restaurant that served canned sardines as a delicacy. From there took a long walk and saw some beautiful architecture and retro furniture stores. Took a power siesta before the last double show night of the tour. Both shows went well and were very well attended. In the break I hung out with soundman, Zoran, who gave me some hot recording tips and showed me videos he’d made at the club of Christian McBride, Terence Blanchard, and my old friend, Sarah Jane Morris. 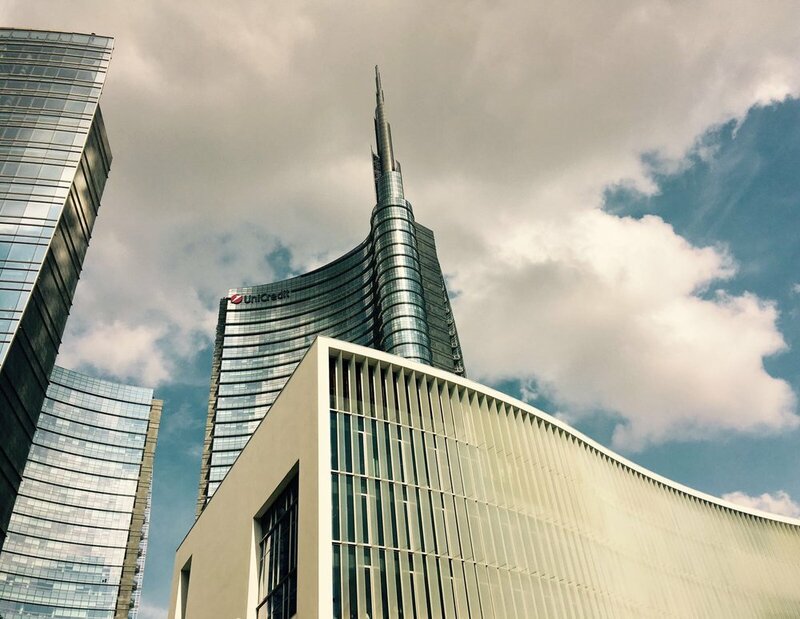 Found a very satisfying run in Milan this morning, round a park and countless awe inspiring ancient buildings. My wife, Judith, flew in later and I met her at the Duomo. We went for a long walk and ended up at a bar where, guess what, we ran into Sebastiaan de Krom and Martin Shaw. The two shows in the evening were very relaxed. We’re all properly into the music now so we can enjoy the overview and appreciate how it all fits together. Judith took some nice shots of the band in action at the club. Anyway, we travelled by a very luxurious train to Milan and checked into a much nicer, quieter hotel. 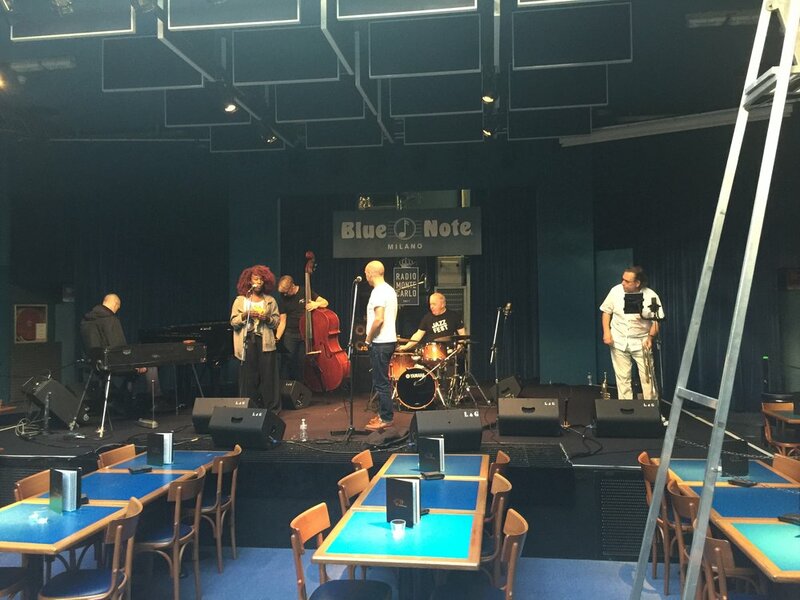 The Blue Note Milano, where we’re playing 2 shows a night for three nights, is a beautiful room with excellent acoustics and a fantastic sound engineer, Zoran. Actually the last time I played here was with Kyle Eastwood’s band and I was so impressed with the live sax sound I went out and bought the same mic (Audio Technica 4033). Apparently that was stolen years ago so we had 414s on the horns. We were well fed and looked after, and the two shows were an absolute joy as the sound was great. Also I was able to enjoy, perhaps for the first time in a really relaxed way, how all the parts worked together and particularly the fantastic detail in Graham Harvey’s comping and soloing in this context. I started my 3rd day in Bologna with a run through the city, trying and failing miserably to follow a GPRS route on my phone. The weather was beautiful and I definitely felt better for the experience, although it was a fairly bleak urban landscape that I found to run! I met the others for lunch in a courtyard garden of a local trattoria. We had another soundcheck later and it really became apparent that the natural booming lower mids in the room acoustic were giving us the problems we were having. We got the horns in the monitors, and although it made Martin and I feel better I don’t think it helped overall. It’s really too small a room for any amplification at all, but we sort of coped. The venue looked after us very well and the audience was happy. 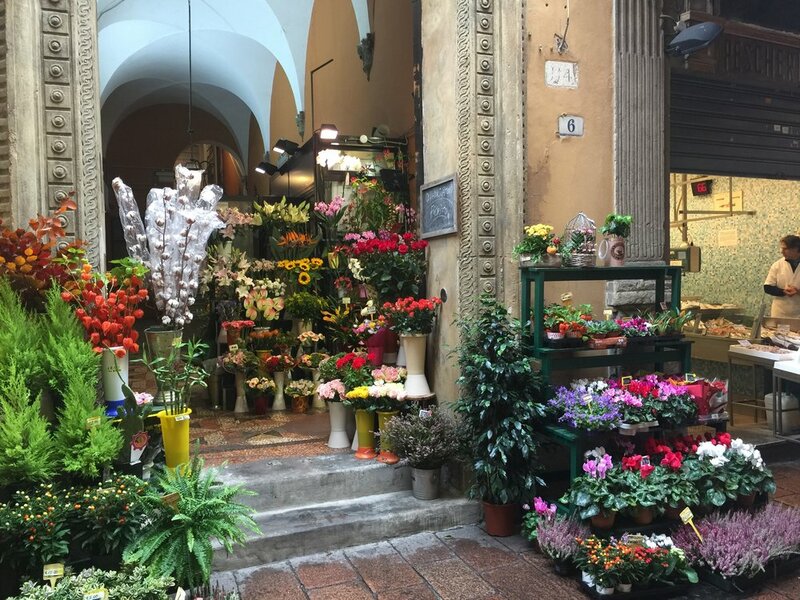 Went for a good walk in the rain around some beautiful cobbled streets and alleyways in Bologna, and found a foodie paradise of cheese and ham, pasta, wine, fish and flower shops. We ended up in a rather sedate up market restaurant where our plans for a light lunch went wrong again! This gig was even more rammed than last night. It was a pleasant surprise to see Tony Remy at the bar. He used to play guitar in Matt Bianco and I toured with him in Jason Rebello's band many years ago. He was on holiday and couldn't resist coming to see us! The gig was really good and considerably tighter than last night. However, the horn monitor didn't work and Martin Shaw and I were fighting an uphill battle. It turned out that the monitor had got unplugged somehow... one more night to get it right! I'm sure it was ok out front but these things are frustrating. Off with Matt Bianco to Italy for a week. Had to set my alarm for 4:15am to pack and leave my house at 5. 8am flight from Heathrow to Bologna on a fully automated BA. That experience was good, because it meant there were no tetchy human beings to give me a hard time about having a saxophone! Everything went smoothly and we arrived in Bologna at the hotel around noon, where they had the rooms ready. We were in a noisy, bustling district literally 1 min walk from the club, Bravo Caffé, where we'd be playing later. 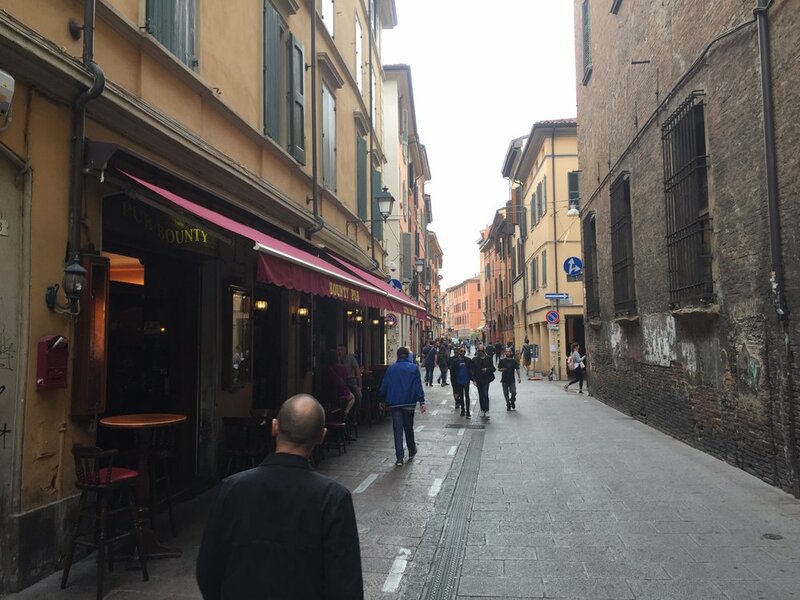 We went out for lunch - a simple bustling Trattoria with a very miserable waiter and fabulous, cheap food. Time to risk life and limb walking through the cyclists and attempt a siesta in the world's noisiest hotel. There was drilling, hammering, shouting, lorries, etc... !! Went to venue at 4pm for set up and soundcheck. There was a weird large sampled piano gadget and a Fender Rhodes, both tuned to different pitches. The Rhodes was closest but out of tune with itself. The "jazz" drum kit was the antithesis thereof, and the rider notice saying "under no circumstances use SM58s on horns" had been ignored. Geoff was complaining that the bass was impossible to play as some notes were louder than others. After some fiddling about, we managed to get something sorted out that was workable if not ideal. All the staff were nice and hospitable and , of course, we ate like kings (again!). The gig wasn't until 10:30pm or so and the small club was packed. It was the polar opposite of our Japanese experience with the tiny, poorly appointed stage and dodgy gear and sound, but the gig was really fun and vibey. We hung out for a while after and walked back in the rain, which is apparently due to stay for the next couple of days. Tour news, views and random musings.